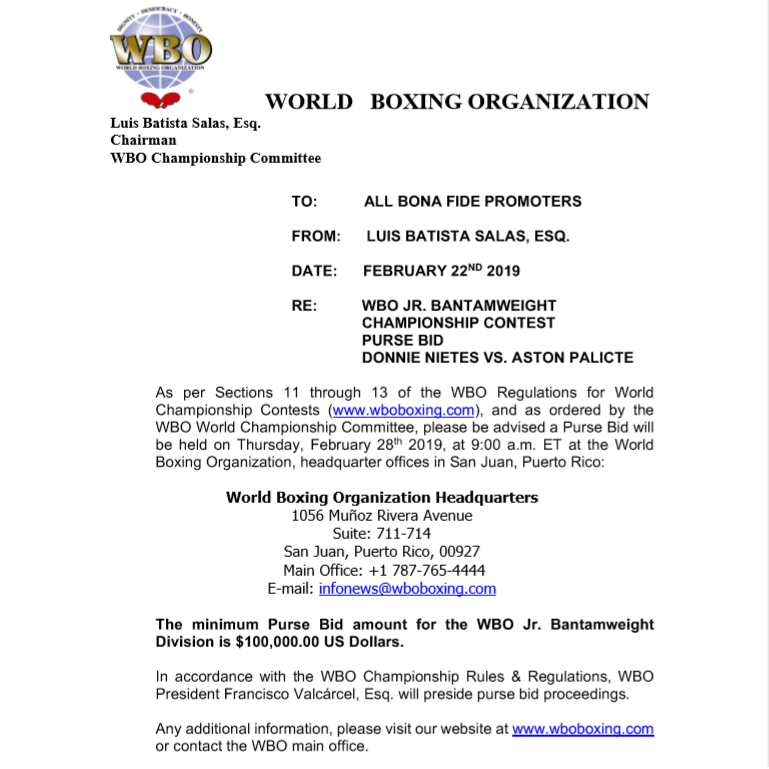 Earlier this month the WBO ordered negotiations for a mandatory title fight between WBO Super Flyweight world champion Donnie Nietes (42-1-5, 23) and mandatory challenger Aston Palicte (25-2-1, 21). The WBO gave the teams from both men 15 days to sort a deal, and yesterday announced that a deal hadn't been reached, so they were ordering a purse bid for the bout. The purse bid is now set to take place on February 28th in San Juan, with a minimum bid of $100,000. The bout will be a second meeting between the two men, who fought to a draw last year. Following their draw both men have picked up a win, with Nietes defeating Kazuto Ioka to win the title, and become a 4-weight champion, and Palicte beating Jose Martinez to become the mandatory challenger for the belt. The WBA Cruiserweight title picture has been nothing short of a mess recently, with 4 different "world champions" at the time. Thankfully we are heading to a point where that mess will be tidied up, at least partially, and today saw the WBA hold a purse bid to begin the long process of getting rid of some of those world titles. The purse bid in question was for the WBA "regular" Cruiserweight title, and was to set up a bout between "regular" champion Beibut Shumenov (18-2, 12) [Бейбут Амирханович Шуменов] and "interim" champion, come Gold champion, Arsen Goulamirian (24-0, 16). It was the only one of 4 purse bids ordered earlier this year to actually take place today, more than a week later than originally scheduled. King's winning bid came with 3 possible venues and dates.The first possibility is on April 15th in Monaco, the second possibility is just over 2 weeks later, April 30th Kazakhstan whilst the other possibility is May 13th in New York. A decision will be made shortly on which of those options will be taken forward. French website www.lequipe.fr have quoted Sébastien Acariès, who promotes Goulamirian, as saying "Given the large amount of the bid, I have no regrets " [Translated] and also seemed to rule out the April 15th option, "King, who sent his representative, he will now have to find a city, but I do not believe in the possibility of Monaco at all." This is likely due to the fact a bout in Monaco would essentially see Goulamirian being the local favourite. On March 26th the WBO issued an open letter stating that purse bids for Tomoki Kameda's (29-0, 18) WBO Bantamweight title defence against Pungluang Sor Singyu (46-2, 31) would be ordered for April 1st. Originally this left us questions as to why. We thought, for all intents and purposes, purse bids for this particular fight had been cancelled with the Kameda's and Onesongchaigym agreeing, in principle to the bout, with out the need for the purse bids. The agreement between the two parties had been for the fight to take place either in Japan or in the US. However with Tomoki Kameda currently unlicensed in Japan his team seemed to try and suggest that the bout would then be either the USA or Mexico. Onesongchai rightfully complained at the switch from Japan to Mexico, where Tomoki has a sizeable fan already, was not part of their original agreement and the WBO sided with the Thai team. Although the purse bids were due yesterday we're not yet aware as to who actually won. What we do know is that Onesongchai did originally say they were going to pull out all the stops to win the hosting rights of the fight. After the recent Kameda stunt we imagine that Onesongchai won't be willing to be played about and will break open the bank to make sure that they get the fight on Thai soil. Interesting the Thai's have got a stronger hand now than they had when the original agreement was reached. Originally the Kameda team still had a promotional license in Japan and thought that a US promoter would also offer money. The fact they can't promote in Japan destroys any hope of the fight being their and the fact no American deal could be struck seems to indicate that fight isn't as big in the west as the Kameda's may have hoped. Whilst the purse bid option seems to make sense at the moment we actually wouldn't be shocked at Tomoki vacating the belt if Onesongchai win. It seems likely that the fight will be in Mexico or not at all and with Tomoki already talking about having weight problems he may take the decision to vacate rather than go to Thailand. Just hours before the proposed purse bid for Donnie Nietes's (32-1-4, 18) rematch with Moises Fuentes (19-1-1, 10) news broke that the parties had reached an agreement. This agreement in effect cancelled the purse bids and left the the promoters in charge of the bout without any other promotional outfit having the ability to sneak in and host it. Whilst the full details of the agreement are yet to be made public it would seem likely that the parties have reached an agreement that sees the away fighter getting a slightly better purse than if they were fighting at home. What we do know, and what is public, is that the fight will see the WBO Light Flyweight and WBO interim Light Flyweight titles unified. 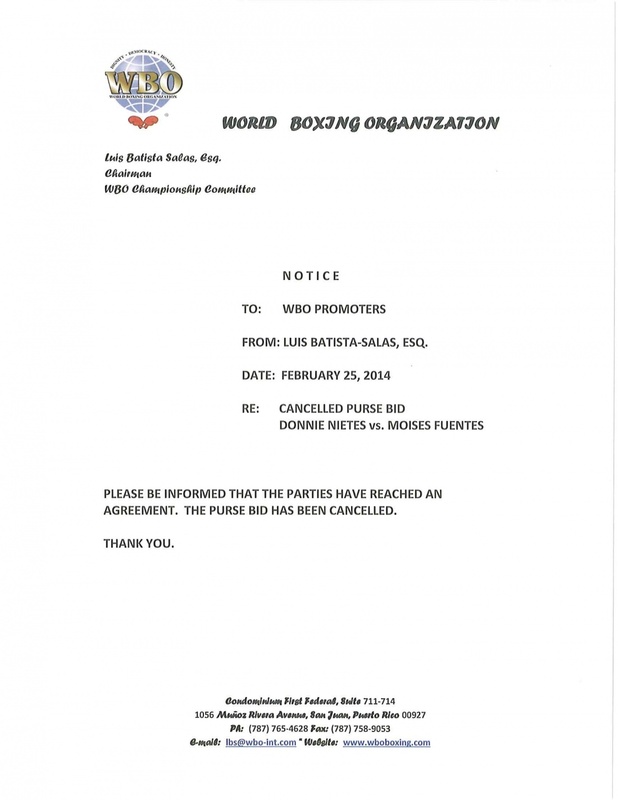 That's because Nietes is the WBO champion and Fuentes is the WBO interim champion. It may not be a major unification but it's nice to get rid of an "interim" title, something that was seem to have far too many of. What we also know is that this is a rematch that means a lot to both men. Last year Fuentes travelled to the Philippines and got the short end of a very controversial draw. Many, including ourselves, felt Fuentes had done far more than enough to deserve the decision though Nietes promoter, Michael Aldeguer, said the right things to make it seem like his fighter had been harshly done to. With the controversy over the first bout still being spoken about we expect the rematch to be just as exciting and see both men trying to up their game from the first contest. For Nietes this should be easy, he was awful that night and did very, very little. As for Fuentes he was on top of his game and may know that had the fight been anywhere else on the planet he'd have been crowned the champion. We will be updating you on the details of whatever was agreed when we get the details, which we are hoping will be sooner rather than later.